Allari Naresh had a series of duds recently and he is planning his career moves carefully. 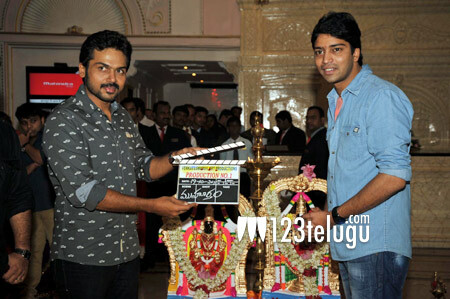 A new film of Allari Naresh has been launched in Chennai today. Hero Karthi has graced the occasion along with the other prominent dignitaries. Reliance Entertainments and Ambika Krishna are jointly presenting this movie and is being produced by Ambika Krishna on his new banner Venkateswara Art Productions. E Satti Babu who has earlier directed several comedy films is the director of this film. This movie is the remake of a Tamil film ‘Kalagalupu’ and Naresh will be playing dual role for the first time in his career. This movie is expected to be an out and out comedy film and shooting will commence from November 10th. Swathi Dixit is one of the female lead and hunt is on for another heroine. Vijay Ebenzer is composing the music and movie is expected to release by March end.